Today we are posting about a very innovative project for Electronics and Electrical students. The title of this final year project is "voice used to charge mobile phones". In this new method, sound energy will be converted to electrical which will allow the charging of the phones using the power of human voice. You can also subscribe to FINAL YEAR PROJECT'S by Email for more such projects and seminar. In this modern era, the most common problem we face everywhere is the noise pollution from different sources whether it is due to traffic, industries or even domestic. So, is it possible to convert sound energy into electricity? If that is possible, we can effectively use sound energy to some productive use. This technology works on the principle of piezoelectric phenomenon i.e., electricity produced by mechanical pressure on certain crystals (notably quartz or Rochelle salt); alternatively, electrostatic stress produces a change in the linear dimensions of the crystal (Conversion of mechanical energy into electrical energy). When the crystal is mechanically strained, (here sound energy) or when the crystal is deformed by the application of an external stress, electric charges appear on the crystal surfaces; and when the direction of the strain reverses, the polarity of the electric charge is reversed. This is called the direct piezoelectric effect, and the crystals that exhibit it are called as the piezoelectric crystal. Here the sound waves vibrates and then the vibrations are fed into the system and produce the output as electrical energy, which is used to charge your mobile. In this method, small strands of zinc oxide are used which are sandwiched between two electrodes. A sound absorbing pad is placed on the top of the sandwiched zinc oxide electrodes. The sound absorbing pad on top vibrates when sound waves generated, hit the sound absorbing pad. This results in the tiny zinc oxide wires to compress and release. The compressions and rare fractions are due to the sensitivity of the ZnO. 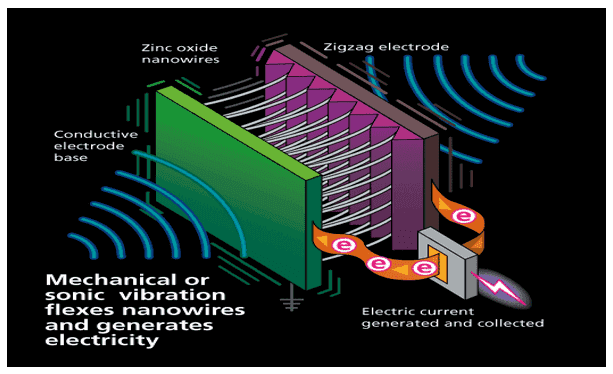 A nanogenerator is placed between the sandwiched zinc oxide electrodes. The compressions and rare fractions are given to the nanogenerator. The nanogenerator converts the given mechanical energy into electrical energy. The generated electrical energy is used to charge the battery. This is how this project works. For full details and working, please download the project report from the below link. It contains basic principle, working of the project, component used, advantages, disadvantages, application, future scope, etc. 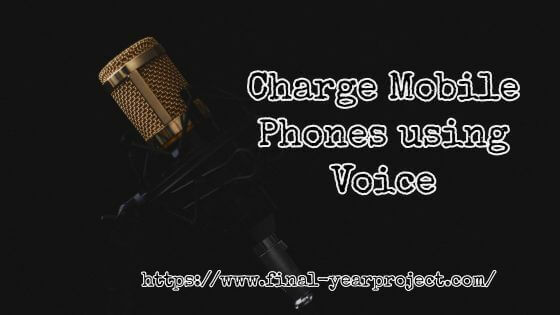 Use this project report on "voice used to charge mobile phones", for your reference only.